Recently Updated: A trusted leaker who goes by the moniker “Ice Universe” recently leaked a bit of info regarding the battery capacity of the Samsung Gear S4. 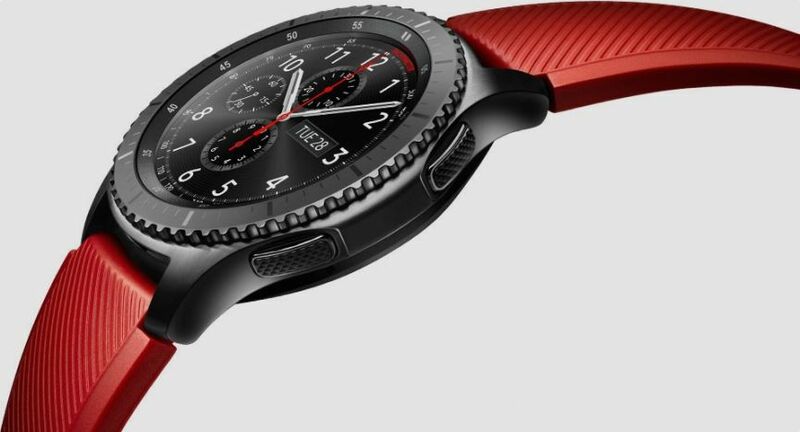 Ever since the world came to know about the Samsung Gear S4, everyone has been waiting with baited breath to find out what all it will bring to the smart wear industry. Many expected the company to introduce their new product at the IFA annual consumer electronics show held in Germany last year but the S4 wasn’t mentioned in their presentation at all. As of now, numerous rumors are being posted online once every few days and it’s easy to get lost in that great tide of the unknown. 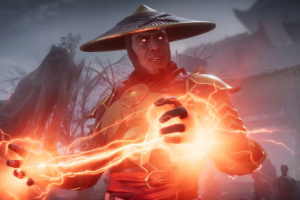 As of this point in time, it is impossible to know exactly all the details surrounding this much-awaited product but we can sift through the massive amount of rumors and leaks to get a clearer picture of what is to come. 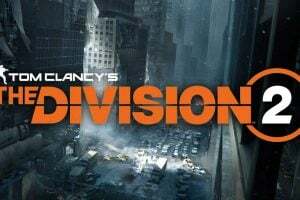 Keep watching this space for the latest updates, announcements, leaks, and rumors. Speculations on the Samsung Gear S4 smartwatch announcement start in early 2017. At the IFA in August 2017, Samsung announces the Gear Sport smart watch disappointing speculators. Information about Samsung working on the Gear S4 is released from SamMobile. Trademark applications regarding a name change start off speculations that the S4 might be named “Galaxy Watch”. A slew of different patents offers insight into what Samsung may be planning for their coming products. A leak on Twitter claims that new Gear watches feature Wear OS and not Tizen (later debunked). 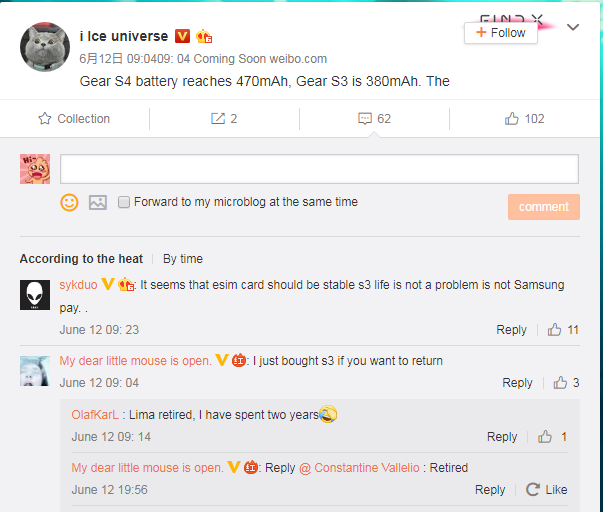 Well known leaker, “Ice Universe” claims that the S4 will have a larger battery than the S3. 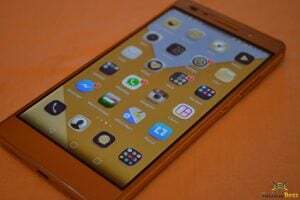 Sammobile came out with exclusive information regarding a gold color option for the upcoming S4. A trusted leaker who goes by the moniker “Ice Universe” recently leaked a bit of info regarding the battery capacity of the Gear S4. 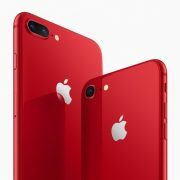 According to his post on Weibo, the S4 is likely to have a 470mAh battery which is substantially bigger than the 380mAh battery we got in the S3. Sammobile also came out with exclusive information regarding a Gold color option for one of the variants for the S4. They received confirmation on the fact that the Gear S4 will come in three color variants, namely Silver, Gold, and Black. The Gold option, however, will only be available for one of the two S4 variants. 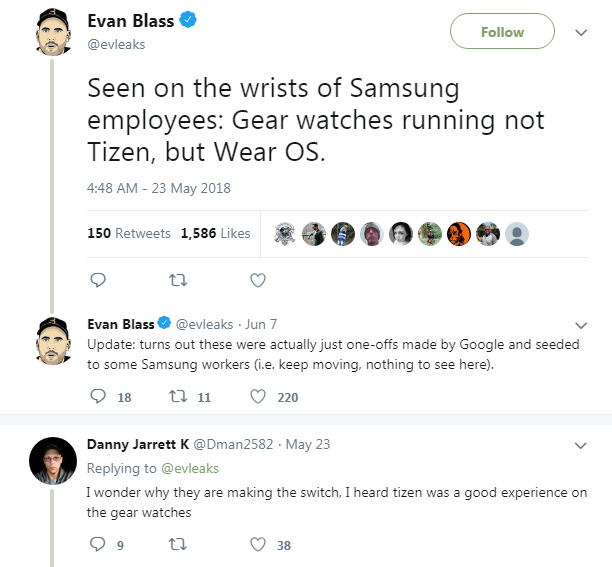 A Twitter post by the famous leaker Evan Blass claims to have seen employees at Samsung wear Gear watches with Wear OS instead of Tizen. The latest update to that post confirmed that these watches were just one-offs made by Google for promotional purposes. A few weeks ago, Samsung filed trademark applications for “Galaxy Watch” which led to many people speculating that the Gear S4 might go through a branding change. However, others believe this new picture to be that of a different smartwatch named the ‘Galaxy Watch’. As of right now, we can’t give any concrete information on this matter because we know far too less to come to any conclusion. Official information about the Gear S4 hasn’t been released yet; however, by following the different patents being applied for, we can get a faint picture of what Samsung has planned or at least the direction they plan to go in. According to what we have heard so far, Samsung seems to be creating features primarily on internet connectivity, health, fitness and sleep tracking. 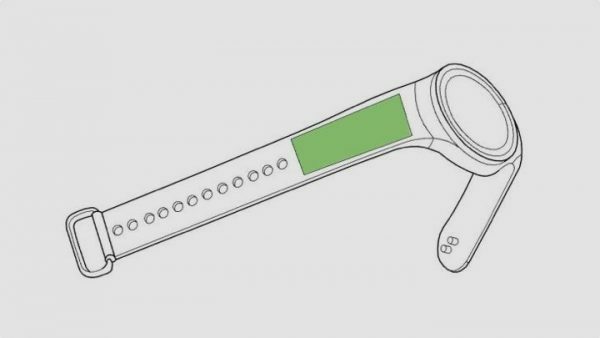 One patent also showed screens on the strap, allowing you to see and select various icons right from your strap rather than the tiny display on the face of the watch. One of the patents filed by Samsung shows their interest in developing an accurate blood pressure measuring technology for a future product. 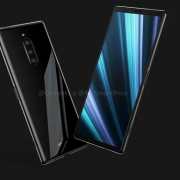 The product in the patent is designated as “Gear X”, however, it does seem likely that it may be the S4 as the company had already announced their interest in focusing on health aspects as a main feature of the S4. 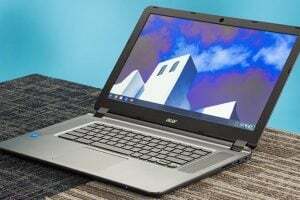 This is another feature that is claimed to be in the upcoming S4. While the technology is already present, Samsung is planning to go more in-depth into this feature according to reports online. The same report noted above has also come out with information regarding Samsung’s plans to offer an LTE variant in their future wearable products. As of now Verizon, AT&T, and T-Mobile are all rumored to be carriers for the S4. Bixby being Samsung’s official digital voice assistant might make an appearance in the S4. It is speculated that it will be replacing the S Voice in the upcoming smartwatch. Though Bixby didn’t make it on last year’s line of smartwatches, there really isn’t any reason why it would be left out this year too. With Bixby, Samsung can easily unite all their smart devices under a single voice tech. In one of the patents filed by Samsung, we can see a wireless charging smartphone case that can be used to charge smartwatches. One burden that smartwatches have is their need to be charged every now and then. A lot of times you end up having a dead smartwatch on your wrists if you forgot to charge it every other day. The design of the Gear S4 certainly is one of the most rumored aspects of this product. Different sources have come out with different rumors regarding the overall design of the S4. One such leaked rumor states that Samsung is planning to release two different sizes for the watch. As for the physical specifications of the product, we are guessing a 1.3-inch display similar to their other watches. What is really interesting is the various patents Samsung has applied for so far. Here are a few of them. One of the patents applied last year by Samsung points to a possible direction they might be considering for the Gear S4. The image in the patent shows a flexible display fixed on the edge of the dial. This would help users to easily get access to their shortcuts with a single click and remove the need to go through several menus to get where you want to go. This is a great concept to integrate into a smartwatch. Most of the time smart watches end up being rather bulky from all the different features integrated into it. 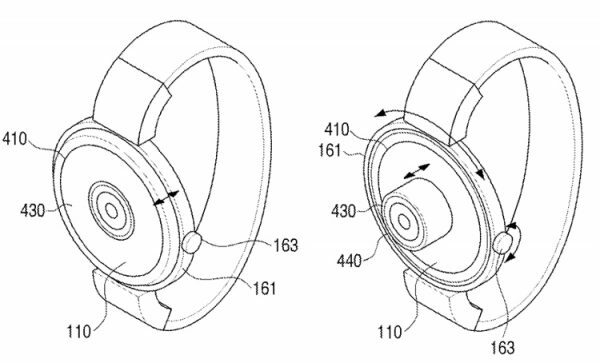 One patent brilliantly describes a way to make the smartwatch lighter and thinner by having the battery in the strap instead of the dial. If achieved, not only would it make the watch more comfortable to wear but also free up space to utilize a different feature or technology. This patent shows a protruding zoom lens placed in the center of the dial which could be a great tool for clicking photographs on the go. 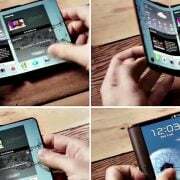 As of now, it’s a little far-fetched in terms of practicality and technology wise but if Samsung manages to implement this in the S4, it would create a massive ruckus in the smart wear market. 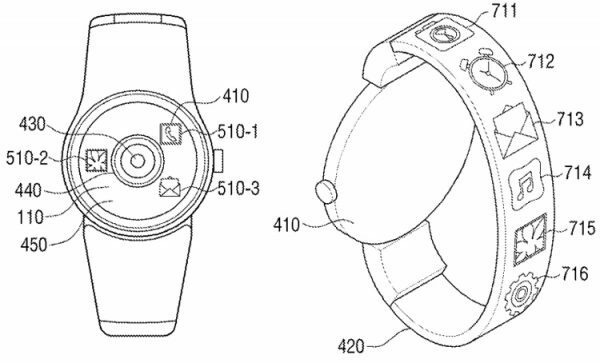 One of the patents issued by Samsung shows the display integrated into the strap itself. It would be pretty awesome to have the battery in one strap and a display on the other. 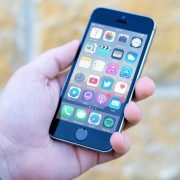 The patent also talks about giving the user the ability to customize the shortcuts on the strap so they can choose which apps to have right in front of them. It is however very important to state that not all patents actually make it to the final product. Usually, companies apply for several hundred patents before working on a product and only a handful of them make it to the end. If Samsung manages to get at least some of the desired tech that has been mentioned in its patents, we might be looking at an absolute game changer in the S4. No official information has been released so far regarding the specs of the Samsung Gear S4. It is likely that the S4 won’t be using the Qualcomm processor as the last one was already pretty outdated when it was released. In 2016 however, Samsung came up with their own chipset, the Exynos 7 Dial 7270 which had more processing power than the Snapdragon wear 2100 and was far more efficient than the latter. What made it better was the fact that it was also smaller in size allowing the smartwatch to conserve more precious space. However, it is completely possible that Samsung might come up with a brand new chip for the S4. No official information has been received so far regarding the release date for the Samsung Gear S4. The S2 was released in August 2015, the S3 in August 2016 however, the S4 wasn’t even mentioned at the IFA presentation in 2017. The reason for this might be that Samsung needed some more time till their tech catches up to where they need it to be. Some of the ideas suggested in their patents sound incredible. 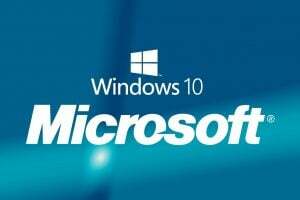 Though all expectations of a release in 2017 were shattered, there is a really good possibility that we might hear some official news on it in August 2018 at the IFA. What price will the Samsung Gear S4 go for? 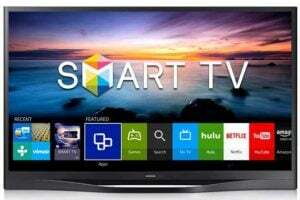 Pricing of this product is another blank area as no official information or leaks have alluded to its cost. However, it would be fair to assume that Samsung will be pricing the S4 somewhere near $350-400. If rumors are to be true that they are planning to release two different sizes for the smartwatch, the smaller one might cost a bit less. 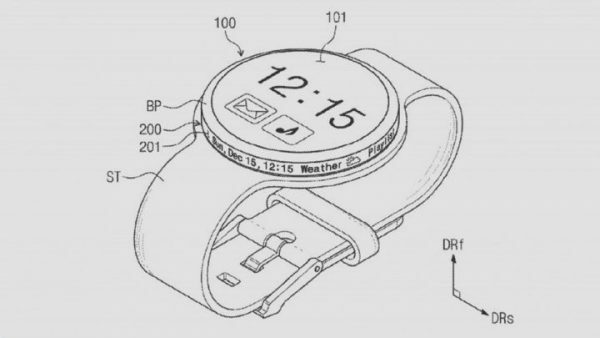 It’s very much possible that Samsung might release a lower end smartwatch too. At this point, almost everything is speculation. We will be updating this page as more news and rumors pop up. Keep following us to see all the latest news and leaks for the Samsung Gear S4 (or should we say Galaxy Watch for now? ).